There are many methods to valuate a company. If you are a small business owner reading this page, it’s important to understand which methods are most applicable to your business. 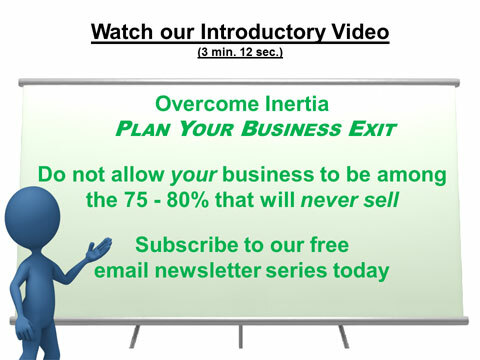 Some methods are primarily for businesses that are not profitable. Some methods are just too complex. Some methods are too general. And there’s one method that is usually most appropriate for small businesses. With few exceptions, using rules of thumb is not a good way to value a business. No two businesses in the same industry are alike. Profitable businesses should be valued as a function of their cash flow generation ability and unprofitable, or marginally profitable, companies are usually valued based on the value of their assets. Many rules of thumb are based on a percentage of company revenues, plus inventory. These rules of thumb are trying to establish a general valuation for “average” companies in an industry. Our advice, as it relates to the valuation of your company, is to ignore any rules of thumb you learn about your industry because they could be extremely misleading. If an owner reaches the end of his ownership term without any planning for the sale of the business, and wants to exit quickly, the business is really only worth the liquidation value of the assets. When liquidating, the business is not typically sold as a going concern. If the assets need to be sold quickly, they may have to be sold at a bargain price, below the fair market value that might be received if there were sufficient time. The best scenario for a business owner is to have sufficient cash flow to enable the business to be valued above the value of its assets. However, especially in capital-intensive businesses requiring a lot of equipment, it’s not all that unusual for the fair market value of the assets to exceed the company’s value based on its cash flow. In such a scenario, the best valuation may simply be the fair market value of all of the assets owned by the company. The business might be sold as a going concern, but that option might be difficult because buyers expect a reasonable return on their investment. Without enough cash flow to cover an asset valuation, it may require a “special” buyer who can utilize the assets more efficiently than the company that is selling the assets. It can take quite a while, a lot of patience, and a little luck to sell a marginally profitable business as a going concern. Profitable businesses are valued based on their ability to generate future cash flows. Professional business valuators use complicated formulas that utilize complex assumptions to predict future cash flows and discount those cash flows back to its present value. They also utilize the market approach which seeks to analyze comparable transactions. But, it’s difficult to identify and/or verify the information provided for private business sales. Professional business valuations also require hefty fees. It’s not always the most appropriate way to valuate a main street business, but can be very appropriate for middle market business valuations. For further information, read Newsletter Issue #54 About Professional Business Valuations. The best way for a business owner to understand how to valuate a company is to learn about the multiple of earnings method. This method utilizes historical cash flow (as opposed to future cash flows) as shown on the company’s tax return or financial statements. For middle market businesses, the company’s net income is adjusted to EBITDA (Earnings Before Interest, Taxes, Depreciation and Amortization), and a multiple is applied to EBITDA to compute the business value. For main street businesses, further adjustments are made to EBITDA to account for owner compensation and other owner benefits to arrive at Seller’s Discretionary Earnings (SDE). Again, a multiple is applied to SDE to compute the value of the main street business. The above paragraph may not provide a sufficient explanation of the multiple of earnings method. To fully understand it, we suggest reading the six newsletter articles mentioned below.